There are few moments in American history in which the course of events tipped so suddenly and so dramatically as at the Battle of Midway. At dawn of June 4, 1942, a rampaging Japanese navy ruled the Pacific. By sunset, their vaunted carrier force (the Kido Butai) had been sunk, and their grip on the Pacific had been loosened forever. In this absolutely riveting account of a key moment in the history of World War II, one of America's leading naval historians, Craig L. Symonds, paints an unforgettable portrait of ingenuity, courage, and sacrifice. Symonds begins with the arrival of Admiral Chester A. Nimitz at Pearl Harbor after the devastating Japanese attack and describes the key events leading to the climactic battle, including both Coral Sea - the first battle in history against opposing carrier forces - and Jimmy Doolittle's daring raid of Tokyo. He focuses throughout on the people involved, offering telling portraits of Admirals Nimitz, Halsey, Spruance, and numerous other Americans, as well as the leading Japanese figures, including the poker-loving Admiral Yamamoto. Indeed, Symonds sheds much light on the aspects of Japanese culture - such as their single-minded devotion to combat, which led to poorly armored planes and inadequate fire-safety measures on their ships - that contributed to their defeat. The author's account of the battle itself is masterful, weaving together the many disparate threads of attack - attacks which failed in the early going - that ultimately created a five-minute window in which three of the four Japanese carriers were mortally wounded, changing the course of the Pacific war in an eye-blink. 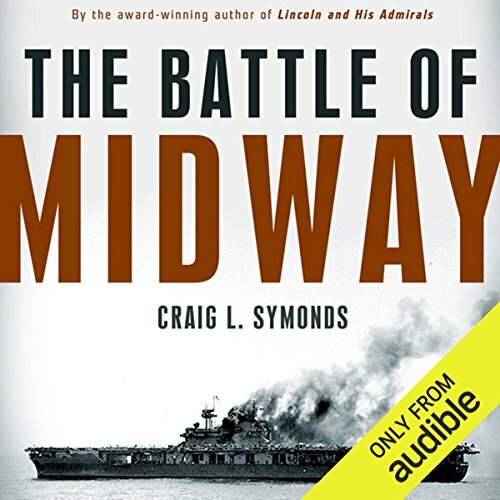 ©2011 Craig L. Symonds (P)2012 Audible, Inc.
Would you listen to The Battle of Midway (Pivotal Moments in American History) again? Why? Absolutely. I had already planned on doing that when I was still listening. There is simply too much information to fully absorb at one time. I've studied Midway in the past and each time I learn more about how close we were to the edge, but how those who fought there never felt defeated. Not a character because this is non-fiction, but my most heroic person, individually, would be Lt. Commander John C. Waldron of VT-8. A real life leader and hero. None. This was a horrible, but necessary event in history. Yes the story of all of the torpedo squadrons and their attacks, but in particular the attack by squadron eight (VT-8) from the U.S.S. Hornet; this piece of history get's me every time. Here were 15 aircraft each carrying three young men in the prime of life. They didn't want to be there and they didn't want to die. Despite that and knowing full well they were outgunned, without fighter air cover, without dive bomber help for a coordinated attack, and flying slow obsolete aircraft; they went in on their attack runs. They knew the odds were heavily against them, but they brought the planes down low, slow and straight and pressed forward their attack. Each in turn. And they were slaughtered. Only one man survived the attack and none of their torpedoes did any damage to the enemy ships. That is real honor and heroism; not that stuff the enemy was shoveling. I actually liked the narrator. His voice, inflection and cadence were appropriate for the telling of this story. Most history books talk about wars a lot, but they tend to focus on the strategic decisions, those big decisions that change the course of a war, like a major military offensive, the supply channels, the number of troops or equipment commandeered, etc. This book is very different in that it is about the tactical detail of one military operation. For this reason it is also unique and I recommend to anyone who is interested about how war really work, on the field. For example, the general story about Midway is that the Japanese did not know that the aircraft carriers would be there and were taken by surprise. But what does it mean to be taken by surprise? Didn't they have their own carriers (and more of them) if the US carriers were actually on site? The tactical side explains that a single bomb will sink a carrier and that, silly enough, the Japanese had indicated their position as a result of a ship chasing a US submarine, that they had sent many of their attack planes on a raid instead of against the US carriers, that they couldn't even locate the latter, and that they had armed their bombs up on the carrier making them even more vulnerable. These are just many things that emerge from the tactical analysis, but there is much more interesting tale about how specific individuals did affect the entire operation, another testimony to the importance of just one person for an entire war. I almost skipped over this book as over the years I have read so many books about the Battle of Midway; I thought to myself do I want to read another book on this subject. I am glad I did decide to read this book as I learned more about the battle from it. Midway was a pivotal battle of WWII. Symond is a professor emeritus from the U. S. Naval Academy. Many historians including Symonds have compared the Battle of Midway to that of Lord Nelson’s win at the Battle of Trafalgar. The comparison is apt as both battles had far-reaching effects on the course of the conflict during which they occurred. The U.S. Navy was on a defensive position after Pearl Harbor. At the battle of Midway the Japanese lost four of the largest aircraft carriers with their crews and aircraft. The U.S. Navy gained a strategic initiative that it maintained for the rest of the War. Symond insist that victory was the result of decisions and actions taken by certain individuals. He proceeds during the book to build his case. Symond recounts and explains the events of the battle both from the Japanese and American viewpoint. Symond also covers the story of the Navy code breakers and how critical that was to the success of the battle as the Navy knew the Japanese intentions. At the end of the book Symonds reviews what happened to each of the key people after the War. Symond provides a lucid, intensely researched account of the battle of Midway. If you are interested in WWII history this is book you must read. James Lurie narrated the book. This was a wonderful book that described the battle both in terms of the action and also with insight into the influence of culture. The author sites many names of those who were heroic but not officers which keeps us attuned to the people who fought this battle as well as the officers and decision makers. The performance was excellent, this book kept us on the edge of our seats even knowing the ending. What other book might you compare The Battle of Midway (Pivotal Moments in American History) to and why? This is a good book that has some very interesting new information, that some of the other books on Midway don't have. There are also flaws in this book as well, such as the deployment of the F4F Wildcat in 1942, Wildcats were operational in Dec 1941, on Wake and Midway, the F2B Buffalos deployed to Midway late in May-June of 1942 were sold to the Dutch government for their use in their colonies but absorbed into the USMC after Java and other Dutch colonies fell to the Japanese. Would you listen to another book narrated by James Lurie? I would have to be very interested in the book to listen to him again, I almost returned the book but the story held my interest. Despite its short comings this is a book worth reading or listening too. This is an exciting story that rings true in its interpretation of history. The outcome is known but the story is not melodramatic. The realities faced by Japan's and America's navies both operational and political are well presented. I got a real feeling I could grasp and understand why things happened as they did, what must have gone through pilot's minds as the reached beyond their fuel limits then missed with all bombs or torpedoes. While Washington seemed to second guess some of Nimitz's decisions they seemed to smartly remain largely hands off. Actually, that part doesn't ring true but maybe it was a different time, different respect for chain of command. Seems Japan had it much worse with the army throwing the country into war and mostly leaving the navy to fight it themselves. I almost get the feeling that to Japan's army, the sea war in the Pacific was a distraction that kept Japan's navy out of their way. Based on previous stories (including the movie) I had a little more respect for Yamamoto and some of his officers. This book took some of that away. In fact, I'd say this book made most of the key players leading to the battle of Midway a lot more human in my mind. Less the glorious hero and more the flawed, brave, arrogant, and patriotic real hero. The author writes the history in a very clear narrative style. The amount of background is sufficient, and introduced in the proper way. In the end he explains not only the Battle of Midway, but the thinking, strategies, limitations, and advantages that eventually led to the US victory at Midway and in the Pacific War. Mr Lurie has a smooth speaking style. He is the kind of narrator that makes you forget that he didn't actually write the book - he is only reading it. i stopped trying to do housework and just sat and listened to the last chapters. the personal details about the men, the ships and the enemy was just right and didn't get too cumbersome. I thought about the battle and the men long after the book ended. What made the experience of listening to The Battle of Midway (Pivotal Moments in American History) the most enjoyable? This is a tale told over and over again. This version was told in a very fresh manner and I enjoyed the narration. Nimitz: did he have balls! The absolute divine intervention of getting the right mix upstairs and on the deck.